Scroll down to see the large version. Hope you have a large monitor. "Sunrise on Mount San Jacinto: Panorama"
Panorama Merge of 9 Pictures. 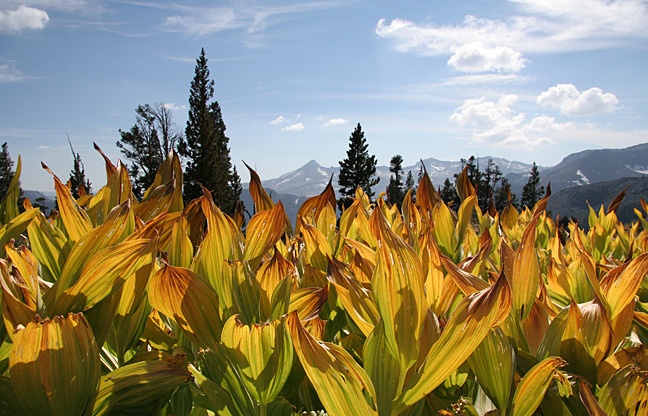 "At 8800 Feet, False Hellebore"
View SW towards Pyramid Peak, Crystal Range. what I saw when lying down among the plants. that is the correct identification. * Since identified as False Hellebore. self-actualization session, 4 male cell phone users, and 3 dogs (fortunately not barking). has some nice autumn colors.